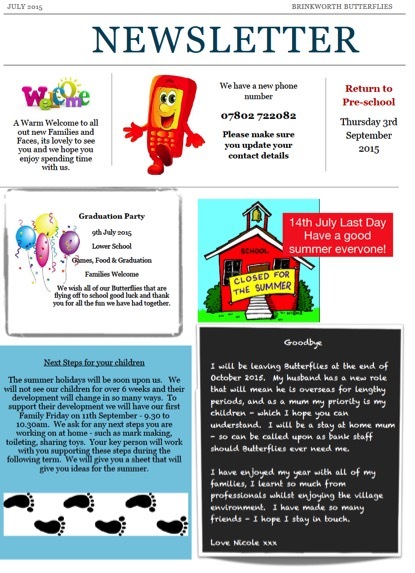 To download a PDF version of the newsletter, please click here July15_Newsletter. Welcome Back, hope you enjoyed your half term break and got up to lots of fun things. We have lots planned for June for the children. Kay has brought in some eggs and an incubator – so we should be seeing some chicks hatch very soon. The children will be able to name them and hopefully handle them too. We have our popular monthly event – music monsters & Leigh Hibbs will be taking photos. The children will be going all around the world on their holiday soon. So we will be having travel agents, airports, food tasting, beaches at pre-school…… so if anyone can spare (loan) us suitcases, bags, travel magazines, a paddling pool (hopefully the weather will improve) and any foreign items for our interest table that would be great. We are aiming to partake in Earl Danby school Sports day which will be at upper school. Your children are more than welcome to be part of the preschool race. If your child is not booked in for this session, you can either book them in as an extra session or you can join staff with your child for the race. Please can you have all your replies back by 5th June 2015, letting us know whether you would like your child to attend & also if you can be a parent helper. • Natural Resources – pebbles, shells, cones etc. Well the festive season is quickly approaching and I for one need to get my children’s gifts purchased ready for Santa! It is a magical time for our young children – the thought of gifts around the tree, sparkling lights but most of all a happy fun time for all, we have lots of activities ready for all our children and even more glitter – as sometimes the Christmas fairies visit and sprinkle their magical fairy dust around us all. The children may even hear Santa’s sleigh bells as the elves make special magical stops around Brinkworth. We will be celebrating the festive season with the pre-school children taking part in a Christmas Nativity. We are planning for the event to be on Monday 15th December 2014. Even if your child does not attend for this session – we would love them to be part of the event (could you let me know please so we can prepare parts). We are planning on serving Coffee & Mince pies too in the kitchen area. Parent support gratefully received too! We are planning for a company to visit us where they will bring in small animals relevant to the winter months. We will keep you informed as to availability. 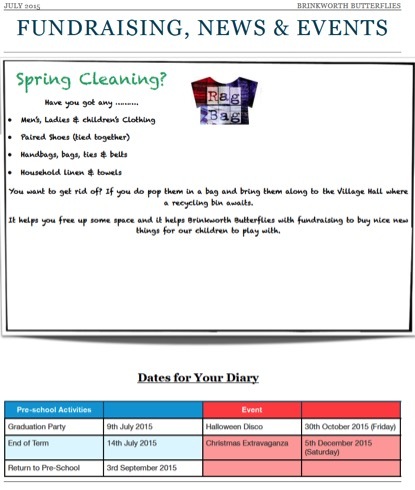 As a charity village setting we value any support from parents – please see us if you wish to help, we need help with reading to the children, tidying resources, assisting at snack time, washing dishes etc. If you can offer any additional support eg. can you play an instrument, do you have a hobby we can share? We are introducing a story and teddy into the setting enabling children the chance to take the teddy home along with a story and a photo-story book. Teddy will be able to enjoy a weekend break with that child, photos of Teddy can be taken of his adventures and you can help write about his time with you too. Teddy has already been to my house and met Ralph the Cockapoo. You will be able to put your child’s name down on the Teddy Take Me Home list – then return him after the weekend at your child’s next session. It will be lovely to see what Teddy has been up to – we can take about the adventures at circle time. We are introducing a Word of the Week – enabling children to enrich their learning through speech. Already we have one child understanding the word “Delicious” and what it means. Every week staff will use a particular word eg. fantastic, superb, wonderful, beautiful – putting them into sentences and encouraging children to follow on with the sentences. Your child’s next steps will be shown during January. Staff are busy getting summative assessments ready. We would welcome the chance to show your child’s learning journey as well as discuss in partnership their next steps. We will send out a day and time availability shortly. We are currently sourcing a new supplier for uniforms – We will keep you updated to availability. Please remember we do keep a supply of “well loved” uniform for 50p per item. You will also be able to purchase book bags too with our logo on, and take part in our reading scheme. Your child will be coming home with their Book Start bags this week. Your children’s card design has been sent the art company for printing. We are planning to hold a little party for the children – party food, music, crafts and of course party clothes. If your child is not booked in on this day please see me so I can put you down for the session (normal fees apply). Our Last day of term is Thursday 18th December 2014. We return to Pre-School on Monday 5th January 2015. It leaves me to wish you a very happy, peaceful, fun-packed festive season; we hope to you will support the pre-school at the Extravaganza – Saturday 6th December 2014 in the village hall where you will be able to meet Father Christmas (and his chief Elf) plus lots of crafts and stalls to enjoy for the whole family. For further details please see our committee.